LA-based artist and mixologist Steph Russ—author of ENERGY: Cocktails to Get You UP— was asked by GOOD Magazine to create cocktails for the trump presidency. I helped Visualize. A Trump-inspired cocktail list wouldn’t be complete without a drink designed for deception. Welcome to the alt-piña colada. While the Alternative Facts resembles the classic, refreshing tropical treat, it’s actually quite bitter, salty, and tangy in flavor. 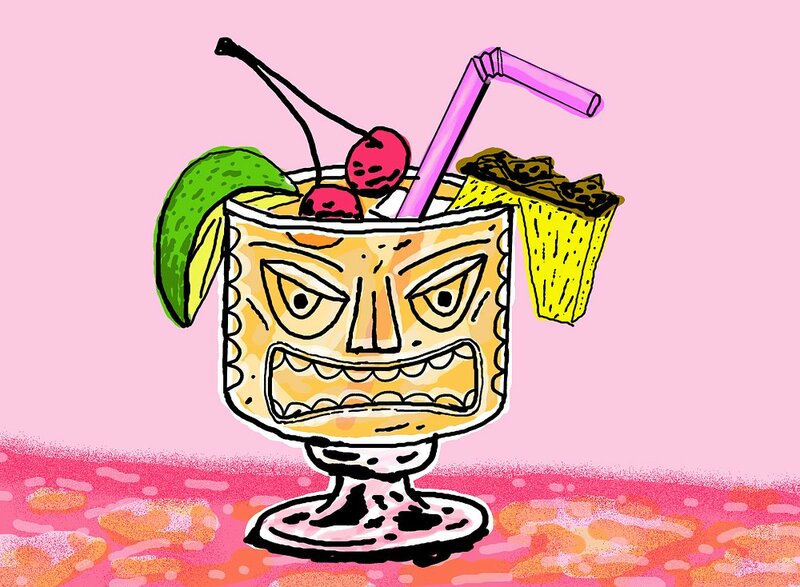 Shake all ingredients over ice and serve in a tiki-inspired tumbler, conservatively topped with fruit. Recommended to serve any time you’re forced to discuss a task you’ve made no progress on and need to divert attention. Pour all ingredients into a goblet over dry ice. Serve as black smoke begins to billow over the cup’s edge. Enjoy with soda, beans, chewing gum, and milk. Warning: Will likely cause excess gas. Fittingly, the FBI Leak is a White Russian, served up in a plastic bag full of holes. Pour all ingredients into the bag, making sure to cover the punctures. When ready—release! Drink whatever you can as fast as you can, before all evidence disappears. Shake ingredients with ice until frothy, and serve in an Old-Fashioned glass. If the cream causes other ingredients to separate or curdle, that’s to be expected. This all-white cocktail will taste like milky garbage, and we do not recommend actually drinking it. Here’s a nonalcoholic cocktail designed for the child in everyone—particularly our elected officials—and is perfect for insolent youngsters and immature adults. Rim a martini glass with lemon juice, then crushed Cheetos. Blend the Tang with ice, like a smoothie, and pour into the glass. Top with Sprite for fizz. Garnish with plenty of Cheetos and the lemon peel. Excess is encouraged. This over-the-top, all-gold cocktail draws its inspiration from the decor at Trump’s opulent penthouse in Manhattan. We can’t promise this drink actually tastes good, but as they say, appearances are everything. Mix all ingredients and serve in a chilled champagne flute or the most ornate glass you have on hand.